DesignPhiladelphia | Econsult Solutions, Inc. The first ten days of October is when the creative community takes over Philadelphia. The 2018 DesignPhiladelphia Festival begins on the 3rd with a kick-off party at BOK Bar, and runs through Saturday the 13th featuring over 120 creative design events in locations throughout the city. This year’s theme, Design Purpose, threads the events which present functional projects that “protect the environment, improve health and wellness, and empower communities.” The desire is to spark action to ignite change. Our colleague Tayyib Smith’s exhibit A Dream Deferred: Redlining Past, Present, Future will be open for the duration of the DesignPhiladelphia Festival. Located in Arts + Crafts Holdings HQ, 600 Spring Garden Street, funded by the Knight Foundation and created by Little Giant Creative, it is an experience based exploration of how systemic policies and practices have reinforced a cycle of poverty concentrated in the poorest large cities among non-whites. The immersive art installation-reflection booth-documentary-with touch technology will open your mind to what has been preventing equal access, aiming to provoke you to think about what you could do to advance equal opportunity. Hours for the exhibit are Wednesday and Thursdays from 12 pm – 7 pm, and Fridays, Saturdays from 1 pm – 8 pm, and Sundays from 1 pm – 5 pm, showing now through November 17. 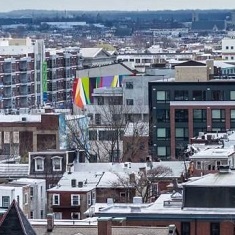 Econsult Solutions is also associated with the Design Advocacy Group (DAG), a public forum and advocate for design quality and equity in the planning, architecture, preservation and physical development of Philadelphia. ESI President and Principal Stephen Mullin was an original founder of DAG. ESI Senior Vice President and Principal Peter Angelides continues as an Steering Committee member. ESI Sponsors the Hidden City Festival | May 23 – June 30 Creative Economic Impact Study City Governance – What’s Design Got To Do With It?